But you know what? It’s OK. Help is at hand. 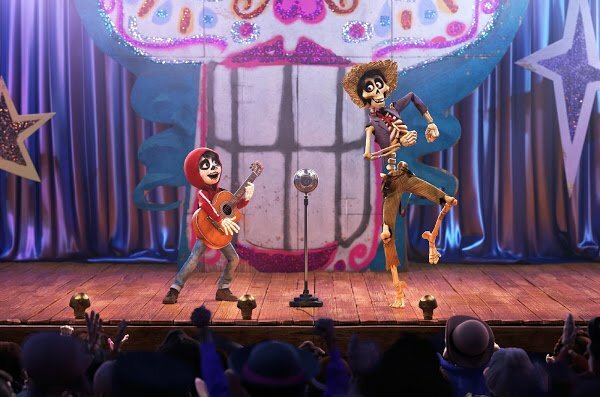 Luckily, Disney•Pixar are about to unleash their new animated blockbuster Coco upon Aussie cinemas this Boxing Day, and not only is it set to be the family movie event of the summer, it’s also a veritable treasure trove of inspo for fun holiday activities that the kids will love. 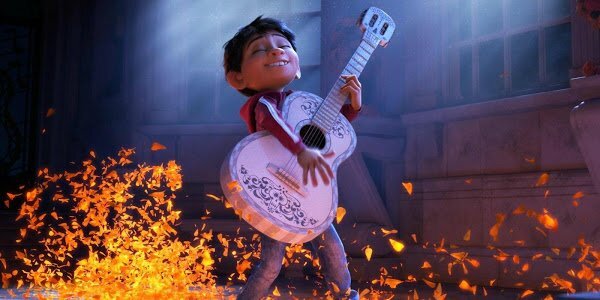 Meet Miguel, he’s the singing, guitar-strumming 12-year-old star of Coco and he’s about to become your littlies’ favourite new movie hero. As he journeys through a colourful Mexican wonderland on a mission to discover a mysterious family secret, he learns some important lessons about family, believing in yourself and following your dreams. And has plenty of LOLs with the new friends he meets along the way! So if you find yourself stuck for ways to entertain the munchkins over the summer break, here’s some Coco-inspired suggestions that will keep cabin fever to a minimum with the added bonus of creating fun and rad family memories. Obviously step 1 is to stock up on popcorn and go see the actual movie! And as a teacher, I’ve used Disney•Pixar’s films in my classrooms to discuss narrative arcs and storytelling. The Toy Story franchise, Finding Dory, Inside Out; nobody tells a story quite like the Disney•Pixar folks, do they? As you’d expect from Disney•Pixar, the film is filled with memorable and charming characters as they set off on an extraordinary journey to unlock the real story behind Miguel’s family history. It’s no surprise then that we are hanging out for the Boxing Day release of Disney•Pixar’s Coco. You should be too! And if you’re extra keen, you can also get involved in this FREE Coco Family Festival event happening in Sydney on Tuesday, 19th December. Has your family got talent? There’s nothing like some music to bring out the smiles and belly laughs, plus it’ll let your littlies take centre stage and channel their inner Miguel. 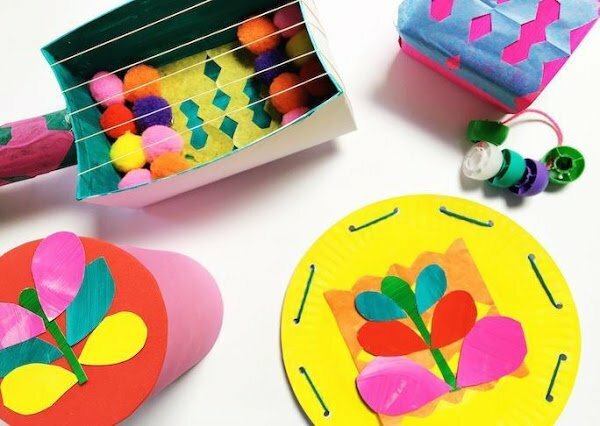 So raid the recyclables and create some homemade instruments! I like to lay out the materials for my littles and see where their imaginations take them. Creating with and alongside the kids leads to the sweetest, funniest conversations about all kinds of life’s most pressing matters. Of course my daughter insisted on a guitar, so we painted a box and used some rubber bands to fashion our own. I used a hot glue gun to secure a paper tube to the side. Pom poms were a highly necessary addition because nothing screams “let’s celebrate!” like some pom poms. Now that your instruments are ready, it’s time to get the band together. Or perhaps there are some family members who prefer performing as a solo act? Stage your own family talent show with your new instruments and be sure to have the camera ready. These are precisely the moments that need to be captured and shown at the offspring’s future 21st birthday parties. Safety note: May common sense prevail. Children should always be supervised when working with small, loose parts and sharp materials like scissors. Steps involving equipment like hot glue guns should be completed by adults. 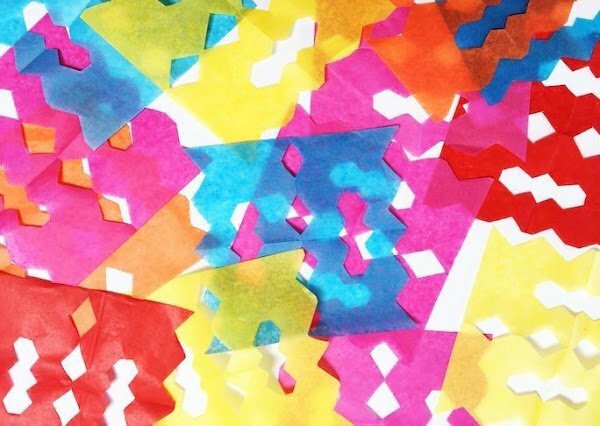 Paper bunting makes life 1000 times more cheerful and fun. This is not scientifically proven but I assert that it’s probably true. For this activity, we travelled to Miguel’s home of Mexico from the comfort of our living room. We didn’t even have to get out of our pyjamas. Win! We used the old Google machine and read about the Papel Picado tradition of Mexico. We oohed and aahed over the beautiful, intricate designs. Then we had a go at making our own. 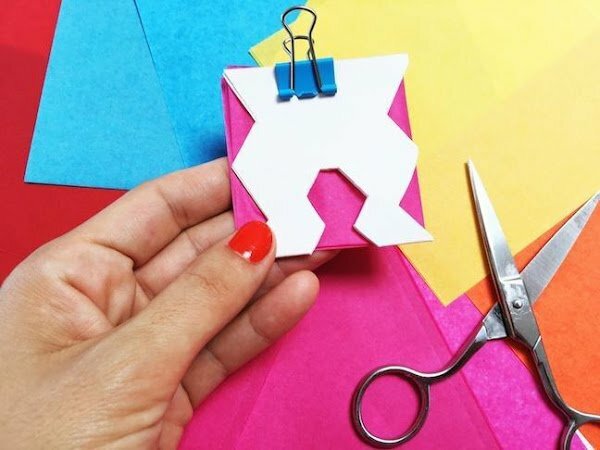 You’ll need squares of tissue paper and a piece of card cut to the exact size of the tissue paper. Fold your piece of card into quarters. Cut some designs into your quartered card and then unfold to reveal your design. It’s fun to experiment at this point and see what designs you can create. Fold your tissue paper in the exact same way you folded your card. Clip your folded cardboard template over your folded tissue paper- make sure the folds all line up. Cut the design into the tissue paper. Carefully unfold your quartered tissue paper to reveal your paper flag. We used double-sided sticky tape to tape our flags against string. You could also use washi tape for a more decorative touch. 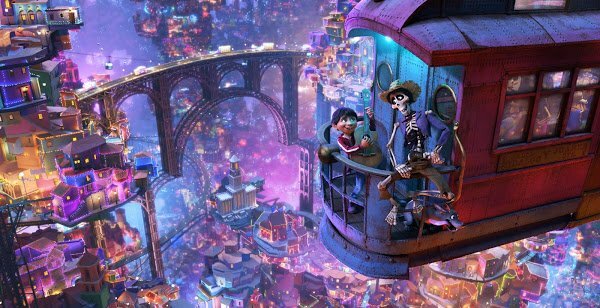 Coco could very well be one of the most breathtakingly colourful movies that the Disney•Pixar crew has ever created (which is saying something!) 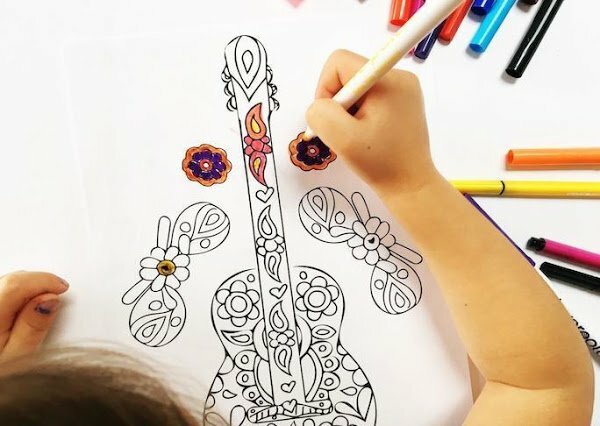 and its stunning rainbow visuals definitely leave your mini-me’s feeling inspired to pick up the crayons! My kids love colouring-in. It always slows the pace and calms things right down. They especially love it when I sit down and colour in alongside them. 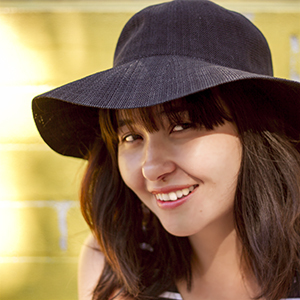 Have you noticed that I’m a massive advocate for creating alongside your kids? This is where and when the magical memories are made, people! Print off this free colouring sheet I made for you! My kiddies always love experimenting with different materials. So bring out the special crayons or markers. Why not use watercolour paints? 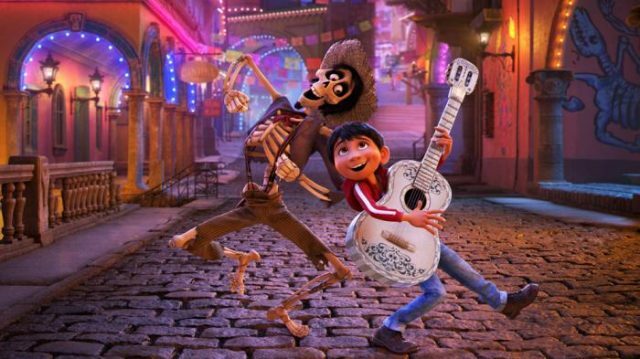 Coco is Disney•Pixar’s latest animated film, which follows the story of 12-year-old Miguel who lives with his grandmother Coco in a Mexican village. Miguel is determined to follow his musical dreams to become a famous guitarist despite his family’s long-standing ban on all music. The film follows Miguel on his heartwarming and fun journey as he embraces his passion and in the process, the truth about his family’s history. It’s the perfect movie to enjoy with the family these school holidays. Check out the trailer below and make sure to join us at our free Sydney event this month celebrating the world of Coco. Head here for more info.